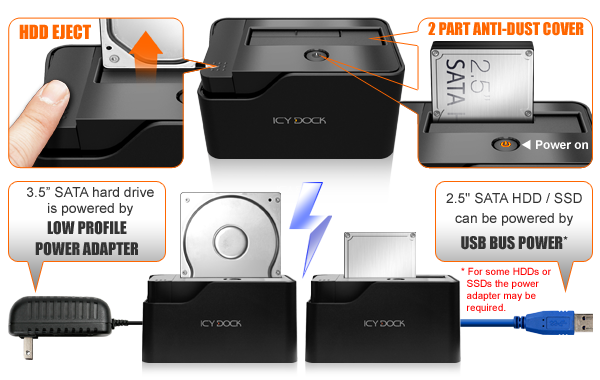 Icy Dock is proud to introduce the MB981U3S-1S 2.5”/3.5” SATA Hard Drive Docking Station with SuperSpeed USB 3.0 & eSATA interface. This product emphasizes the performance and accessibility of your 2.5” & 3.5” SATA hard drive or SSD, a versatile tool for gamers, IT professionals, home, or office users. 2.5” drives can be used on the go being powered by the USB bus, while 3.5” drives utilize a small form factor wall power supply that can be easily stowed away in a laptop bag or briefcase. The 2 part anti-dust cover on the top is divided into 2 pieces, so that if a 2.5” drive is inserted, only the smaller portion of the cover opens up, leaving the electronics inside safe from dust and debris. Other useful elements include a power button on the dock that double as status LEDs, a easy to press, large drive eject button, and as always, a ICY DOCK 3 year warranty. * Completely screw-less / tool-less design for any type of SATA drive. 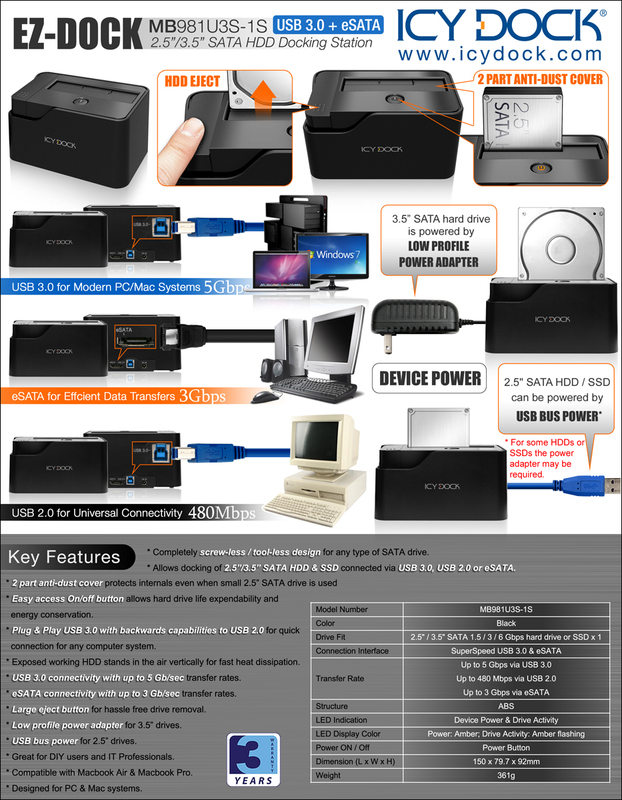 * Allows docking of 2.5”/3.5” SATA HDD & SSD connected via USB 3.0, USB 2.0 or eSATA. * 2 part anti-dust cover protects internals even when small 2.5” SATA drive is used. * Exposed working HDD stands in the air vertically for fast heat dissipation. * eSATA connectivity with up to 3 Gb/sec transfer rates. * Compatible with Macbook Air & Macbook Pro.